.... Worship tells a theological tale, and the tale Shaker worship tells is a sad and sterile one. There was no preaching in Shaker worship and no sacramental life. So what was there? Well, there was a lot of singing and dancing. 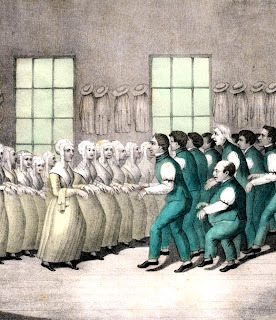 The dances were especially revealing: groups of men would draw near the women, a pitiful mess of conflicted yearnings, and then withdraw. The women would do the same. At other times they would march around each other in concentric circles, men in one and women in the other, stomping their feet and clapping their hands, all the while singing at the top of their lungs about shaking out sin and beating out carnal thoughts. .... It seems to me that the Shakers at least had a vision of heaven that affirmed the earth. But they came at it from the wrong angle. They attempted to plant their feet firmly in the air and reach down to the earth and reshape it. Theirs was a religion in which man attempts to operate on himself. Heaven’s help is not atonement for sin, but insight into the “Spirit Land.” That is why there was no preaching—there was no salvation to announce—and why there was no sacramental life—there was no salvation to receive. For the Shakers, salvation came by “channeling” the Spirit Land into this world.